The beautiful garden at the Jackie Clarke Collection has been internationally recognised by being given International Green Flag status. The Green Flag for Parks award is given to those public parks and green spaces that exemplify excellence in such standards as management and sustainability as well as providing beautiful settings for leisure. 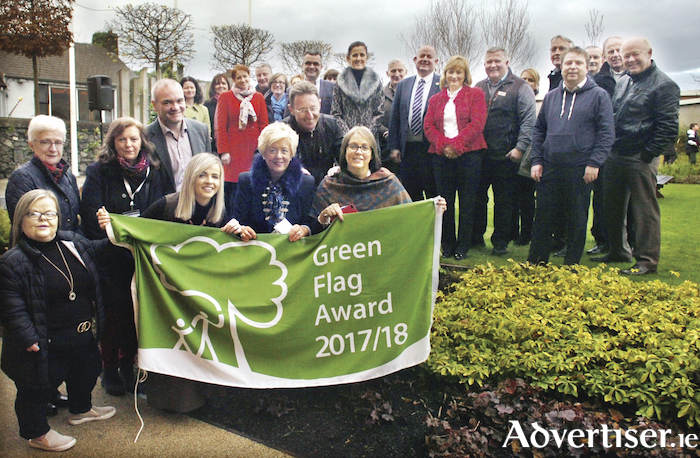 At the flag raising ceremony on Friday last, Robert Moss of An Taisce commented that the garden was a ‘pocket park’ and an ‘oasis of green in a busy town centre’. Moss paid tribute to the staff and volunteers at the Collection who worked hard on different aspects of the garden including accessibility, safety, cleanliness, biodiversity, horticulture, and community involvement. Manager of the Jackie Clarke Collection, Edel Golden paid homage to the community involvement and educational aspects with groups such as Ballina Salmon Festival, Ballina Men’s Shed, the Ladybird and Brownee groups, and Scoil Padraig getting involved through the Community Liaison programme, led out by Anne Marie Forbes. The Education Programme, led by Sinead Brennan was also acclaimed for its effort to engage younger children with nature. Ballina Municipal District Cathaoirleach Annie-May Reape, who raised the flag, remembered the late Anne Clarke, wife of Jackie, in her speech. “Having never had a garden herself, it was Anne Clarke’s wish that the Jackie Clarke Collection would have a garden that would be accessible for all.” The Jackie Clarke Collection garden is open free to the public from Tuesday to Saturday from 10am to 5pm.